Though they round out the lower end of the DP7-PRO price spectrum, the DP7-PRO LCD model is no slouch when it comes to their displays. 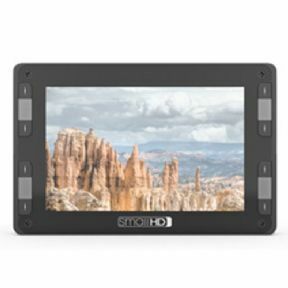 If the DP7-PRO OLED and HIGH BRIGHT are removed from the equation, the DP7-PRO LCD offers the best LCD panel in the industry for on-camera monitors. HD native resolution for increased sharpness, IPS technology for improved viewing angle, and 7-inch diagonal for optimum on-camera viewability set it apart from the competition. DP7-PRO LCD draws about 10 watts—an industry standard across the board. WAVEFORMA high-resolution waveform monitor provides vital exposure date. The DP7-Pro’s Waveform feature can be repositioned around the screen. VECTORSCOPEA large vectorscope gives a detailed view of the color balance in a shot. colors within safe broadcast limits. trackable from any viewing distance. which system you have experience with. the image to appear at the correct aspect ratio. keep you from unintentionally framing your shot “artistically”. image at a 1:1 ratio, meaning you will see a 720p crop of your 1080p image. a full 1080P image down the line. FULL-SCREEN/FULL-WIDTH WAVEFORMA high-resolution waveform monitor provides vital exposure data and can be repositioned around the screen and full-screened. Variants include luma & chroma, as well as individual red, green and blue channels. FULL-SCREEN VECTORSCOPEA large vectorscope (windowed or full-screen) gives a detailed view of the color balance in a shot. Gain may be increased to magnify the vectorscope, helping to keep your colors within safe broadcast limits. FULL-SCREEN HISTOGRAMSafely keep your image exposed properly with the windowed or full-screen histogram which helps you to know where the bulk of the image sits in the IRE range. HORIZON INDICATORWhen operating a steadicam it is common for the camera to begin to tilt without it being immediately obvious to the operator. Using the DP7-PRO’s accelerometer the horizon indicator is a great way to make sure you’re pointed right-side-up. -Includes V-Mount Battery Bracket and DP7-Pro Battery Adapter Plate. -V-Mount Battery Bracket for DP7 Series Monitors. -Attach a V-Mount style battery directly to the back of your DP7-PRO. Gold Mount Anton Bauer Battery Bracket for all DP7-PRO Monitors. -Includes Anton Bauer Battery Bracket and DP7-Pro Battery Adapter Plate.